EL Puertito in Lobos Island Fuerteventura. El Puertito in Lobos Island, Fuerteventura. The Puertito on Isla de Lobos is one of my favorite places in Fuerteventura. It is a natural cove with a backdrop of white sand, well protected from the waves, and the water crystal I've ever seen. The Puertito is full of fish (like a Natural Aquarium), and although not a beach, I have included this area in the Beaches section of the Web, since it is the perfect place for a swim. 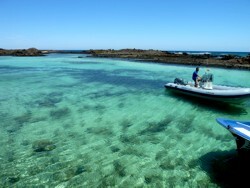 There is a small dock where a small boat moored fishing and pleasure boats Diving School, who come from Corralejo. In THE Puertito there are small fishermen's houses and the only restaurant on the island, which is a pleasure to eat because you have amazing sea views. From Corralejo cruise boats to reach the island of Lobos. The first boat leaves at 10.00, and the latter becomes de Lobos at 16.00 in winter and 16.00 hours in summer.